The German city of Magdeburg is often overshaded by its better known and popular cities in vicinity like Berlin, Hamburg, Leipzig, Dresden and Hanover, but there are many things to do in Magdeburg in one day. Magdeburg was almost completely bombed-out during the WW2, but ater the war ended the city was rebuild and got its old charm back again. Joining the history with some of the new tourist sights, there are many things to do and see in Magdeburg in one day or two days long visit. A visit to the cathedral is one of the best things to do in Magdeburg, as it is the first example of ghotic architecture in Germany. To top it all off, you can also find the vault of the first Holly Roman Emperor, Otto I. or better known as Otto the Great inside of the cathedral. The Magdeburg Cathedral was almost all gone during the WW2 – just the two bell towers were left, so that is why climbing up there is even more interesting and fascinating. Seeing different building periods in one tower and enjoying the views over the city, was for me one of the best things to do in Magdeburg. 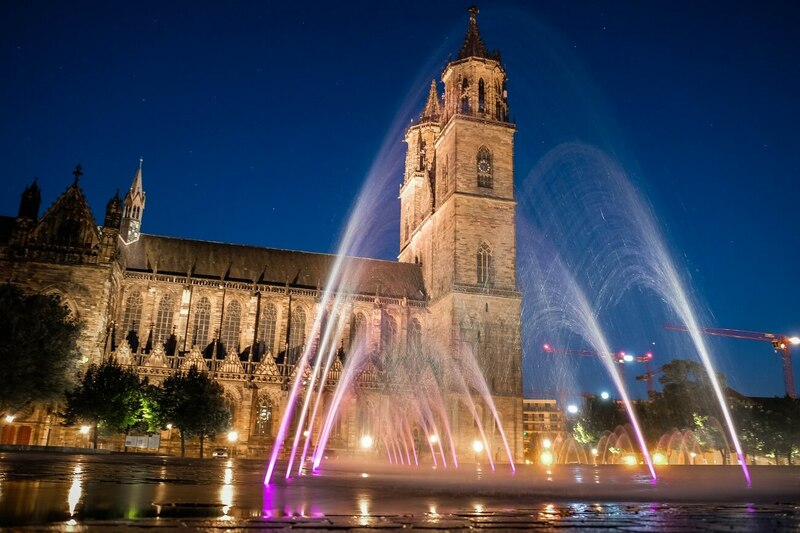 Because of the romanesque influence, Magdeburg Cathedral can also be found at the Transromanica list , which goal is to join and preserve cultural heritage of romanesque sights in different European countries. You can find out more about the Magdeburg Cathedral, Transromanica organization and the rest of the romanesque sights in Saxony-Anhalt region in Germany here. If you have already visited Vienna – the capital of Austria, you for sure did hear for the famous architeckt Hundertwasser and the house he designed. After all, it can be found among the most famous houses in Vienna. Believe it or not, but you can find the Hundertwasser work in Magdeburg too. In fact, the Hundertwasser house in Magdeburg was his last project before death in 2000 and with that a visit of it is also one of the most interesting things to do in Magdeburg. The Hundertwasser style is one of a kind, using irregular shapes, colours and ceramics. Nowadays the Hundertwasser house in Magdeburg is full with cafes, shops, kindergarten and residental apartments, including the Art hotel, where you can get unique artistic room. The roof gardens are open to public in a guided tour once a week. If you are looking for a modern sight in the city, a visit to the Hundertwasser house is for sure one of the best things to do in Magdeburg. A woden cone, measuring 60 meters in height, is one of the highest wooden buildings in the world at the moment. Apart from the interesting architecture, people mostly visit it because of its theme – showing the developement over centuries. While we are climbing through its 243 stairs to the top, we can learn about main characteristics of human development throughout different time periods – from old Egypt to middle ages, renessance and to nowadays. 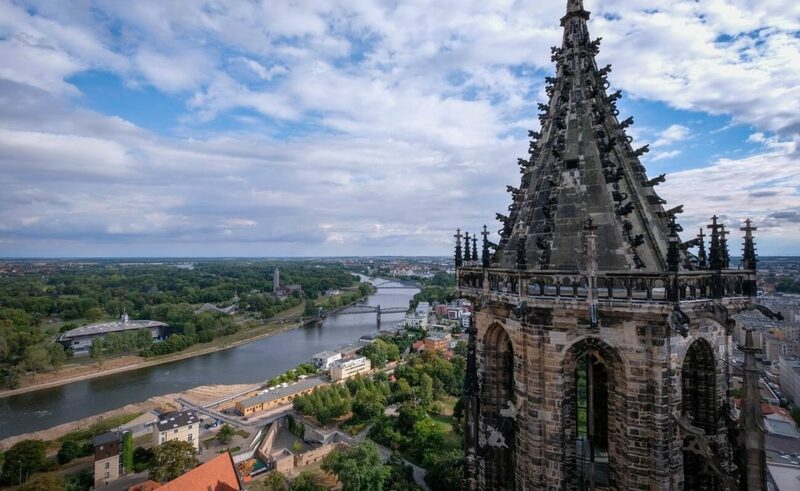 If you are looking for good views over the town and the river Elbe, climbing at the top is definitely one of the best things to do in Magdeburg. The city of Magdeburg lies along the river Elbe, offering almost 1000 kilometers long cycling path, which connects Praque (capital of Checz Republic) to the city of Cuxhaven at the Northern Sea. 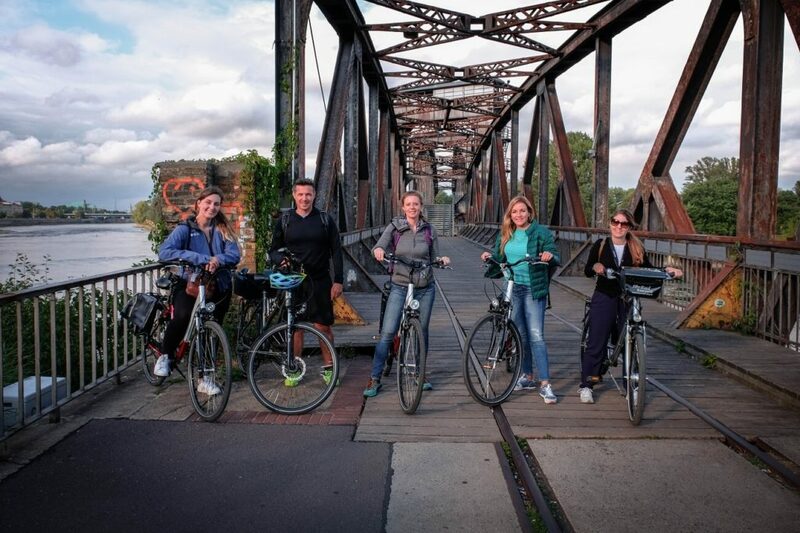 Even though your intention is not to cycle the complete path, renting a bike for visiting few closer towns is for sure one of the best things to do in Magdeburg. I always like to see a city from another perspective and taking a ride on the river Elbe is for sure one of the best things to do in Magdeburg for that. 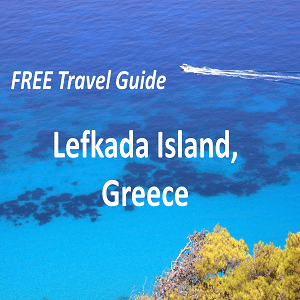 You can embark on one of their boats or you can rent a kayak or even do a stand up paddle tour. The best timing to see the water fountains in front of the cathedral is by night, when they are lighted with different lights. The lighting is changing from blue, green, yellow and pink, what sure looks beautiful. The small square Altemarkt is best visited during its market days or during its Christmas market. But if you are visiting Magdeburg outside of these days, don’t be disappointed, as stopping there can still be put on the list among best things to do in Magdeburg. The Altermarkt was destroyed during different wars, so the oldest building there is now the City Hall from 1250. Inside of the City Hall, we can also find one of the most popular restaurants in Magdeburg – the Rastkeller, which is working since the 17th century. The Rastkeller restaurant is most known for its traditional German cuisine, but if you are not a fan of that, you can indulge yourself in their Biergarten, where the best burgers in the city are being served. The biergarten offers much more than burgers and tasting them was one of our best things to do in Magdeburg. Infront of the City Hall you can also spot a monument, representing independance of the city. There’s also a gilded statue in front of the City Hall, which shows the Otto the Great. Every city has parks and the Rotehorn Park is the largest in Magdeburg. The Rotehorn Park lies at the Werder island in the middle of the Elbe river and is marked as one of the most beautiful English designed parks in Germany. With its 200 hectares it is very popular among locals – don’t forget to rent a rowing boat at its lake Adolf-Mittag See during the summer. One of the best things to do in Magdeburg to avoid the summer heat and find a quiet place. I am not sure why, but I am always happy to find a new swing. The one in Magdeburg was so much fun as it was big enough for several people. It also has the perfect view – right across the Elbe river stands the city cathedral. 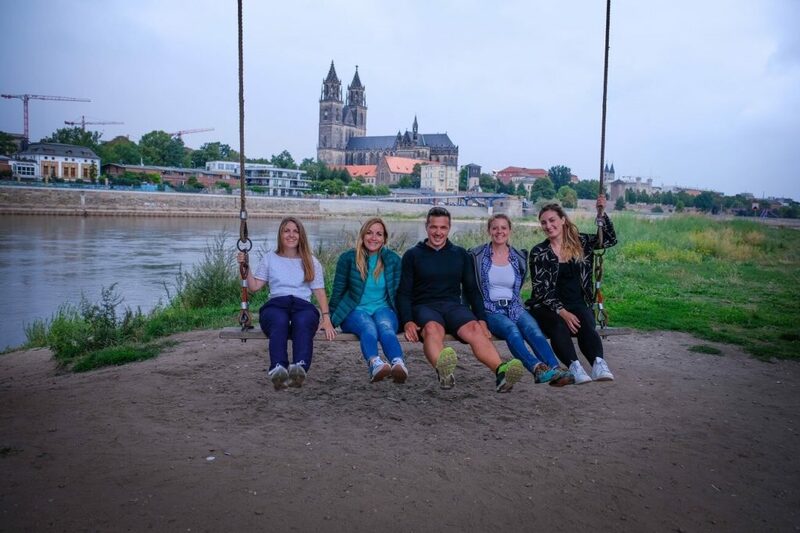 The swing is for sure one of the best things to do in Magdeburg if you are visiting the city with a group of friends and family. If you are visiting Magdeburg with kids, one of the best things to do is visiting its ZOO. You can find more than 200 different animal spieces on 16 hectars and a special area is a walk through among monkeys, owls and canaries. Magdeburg is attractive also because of its streets, so strolling around them cannot be missed when you are there to get to know the city vibe. One of the most colorful and for me, also photogenic things to do in Magdeburg are seeing its bird houses, which can be found at the Hundertwasser house. But the bird houses have a special meaning in Magdeburg – the city holds the Guiness world record of the longest continuous bird houses chain. During the summer 2018 more than 4300 bird houses were conected on the square in front of the cathedral. I must admit that if we would not be visiting Magdeburg for the Transromanica blogger trip, we would probably still not heard for the city. I guess less known places and hidden gems are always full of positive surprises and that was Magdeburg for us too. If you find yourself in the neighbourhood, don’t over look it, as there are many interesting things to do in Magdeburg. 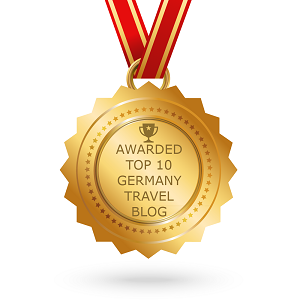 Magdeburg is well conected with public transport – we would suggest using trains in Germany. For example – to reach Magdeburg from Berlin by train you will need 2,5-3 hours. The train station lies in the city center, what is great location to visit the tourist attractions, which we put on our “Best things to do in Magdeburg” list. How to explore Magdeburg in one day? The old town of Magdeburg is small, so you can easily walk around it and reach by foot all the major things to do in Magdeburg. If you would like to see the wider area, one of the best things to do is renting a bike. Where to eat in Magdeburg? You can find several restaurants in Magdeburg – close by the Hundertwasser house is the Japanese and Spanish restaurant. If you want to enjoy local German cuisine, your best bet is to visit the Rastkeller – one of the most popular restaurant among locals and with that also one of the best places for lunch or dinner. If you’d like to spoil your taste buds with burgers or ribs , stop at the Rastkeller’s biergarten. Note the biergarten is seasonal – opened from May to October. Where to sleep in Magdeburg? 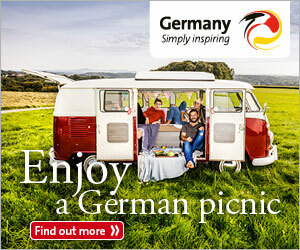 Magdeburg has different accommodation options to choose from, including hotels, hostels and a campervan stop. But if you want something unique, go for the central located Art Hotel – wich is set in the famous Hundertwasser house. You can get more information and photos about the Art Hotel here. But staying in the Hundertwasser house is definitely one of the best things to do in Magdeburg.